Often times it is less costly to purchase a rack of lamb and cut it into individual chops at home. It really isn’t difficult if you have a sharp chef’s knife, use the rib bones to guide your knife and apply firm pressure as you reach the bottom. I like to trim the fat cap that lays on the top of the tender meat before I separate the rack into chops. 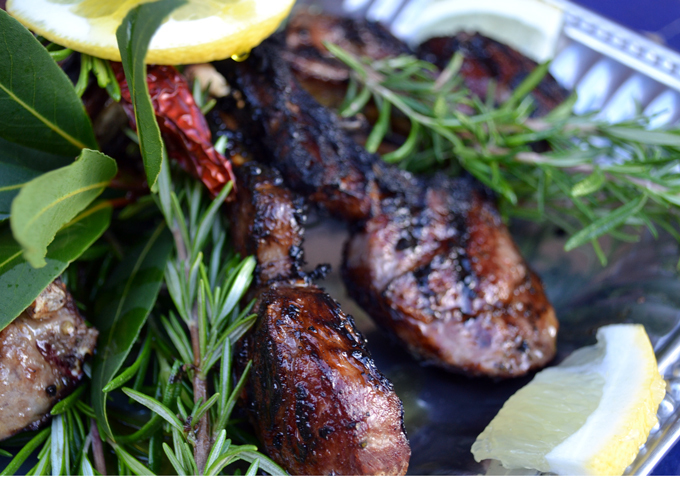 A light marinade of garlic, oil, rosemary and bay is all that is needed to compliment the lamb. The trick is to have your grill red hot and entice guests by gathering them around as you perform your magic. Don’t have an outdoor grill? That should not discourage you from attempting Agnello a Scotta Dito. Take the party indoors and heat up a cast iron skillet to the smoking stage on your stove top (be sure the exhaust fan is on high). Those tender tasty little chops are irresistible either way and well worth your burnt fingers. If you enjoy Italian food and lifestyle, please subscribe below and share La Bella Sorella with your friends. Agnello a Scotta Dito - Grilled Lamb Chops "Burn You Fingers Style"
If you are using a rack of lamb, trim some of the thick layer of fat, known as the fat cap, from the top of the rack. Resist the temptation to remove it all, as this provides flavor and moisture to the lamb. Place the rack onto a sturdy cutting board and with a sharp chef's knife begin to cut the rack into chops one at a time, using the rib bones as a guide. As you get to the bottom of the rack apply firm pressure continuing to use the bone to guide your knife. Set the individual chops aside. Place the leaves from the rosemary sprigs,1 bay leaf, the peeled garlic cloves and salt on a clean cutting board. Chop the herbs and garlic together with the salt; the salt will act like an abrasive to help you achieve the correct paste like consistency. Season with freshly ground black pepper and the crushed red pepper if you like. Place the lamb chops in a rectangular glass or ceramic baking dish. Take a bit of the herbal paste and begin to massage it into all sides of each of the lamb chops, place into the baking dish, laying the second bay leave over the top. Allow the lamb chops to marinate in the refrigerator for 2 to 4 hours before grilling. One hour before grilling, remove the lamb from he refrigerator and place on the counter to come to room temperature, not warm. Preheat your outdoor grill or a cast iron skillet indoors on high heat to red hot. If you are preparing the lamb indoors, turn on your exhaust fan. Pat the chops with a paper towel to gently blot some of the olive oil off, without removing the herbs; this will help prevent a grease fire. Place the lamb chops on the hot grill or in the hot cast iron pan, about 3-4 minutes per side. Platter immediately, garnished with additional rosemary sprigs & lemon wedges. Serve at that moment. Sounds like the perfect pairing, thank you for your comment and recommendation.